The year is 365.2422 days long. To make this inconvenient number fit into calendars with whole numbers of days in a year, a system of Leap Years is needed. Julius Caesar decreed a calendar with years of 365 days, with an extra day every four years. That was equivalent to using as the number of days in a year. This number was a little too large, so that more Leap Years were added than needed. Over the years, the error built up to ten days, until in 1582 Pope Gregory XIII decreed that there should be a Leap Year in every year divisible by 4, except in years that were divisible by 100 but not by 400. DAAD, the German Academic Exchange Service, in association with AIMS, provides five in-region scholarships for a PhD programme in Mathematical Sciences. These scholarships are available to students wishing to commence a PhD programme at a South African University. Funds awarded by the scholarship must be used towards covering the costs of tuition fees, living expenses, medical insurance, books, stationery, research literature expenses, study permit and re-search. Eligibility: African nationals from Sub Saharan countries (excluding South African nationals), and not older than 36 years of age on the date of nomination may apply. Women are particularly encouraged to submit an application. For more information and to apply please visit the website. showing that the difference between successive terms in the sequence of ratios is alternately positive and negative. Now look at the second terms in the numerator and denominator. 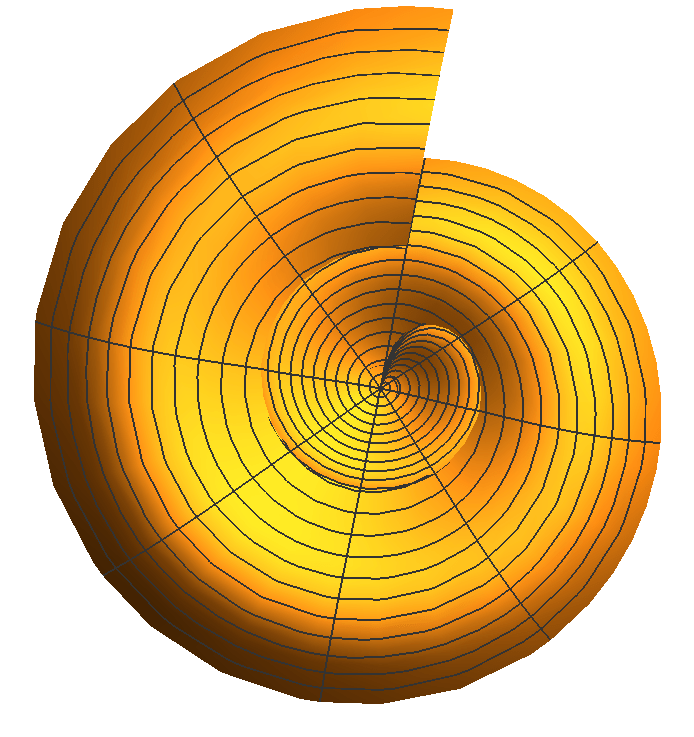 Check out the link between the golden spiral and the Fibonacci sequence here. This definition allows one to find any Fibonacci number, but for large values of it would be time-consuming to compute this way. Worse, any error of calculating a term would be repeated and magnified in every subsequent term. So a natural question to ask is whether there is a simple formula, in terms of , which enables one to calculate without having to find all the earlier Fibonacci numbers. In 1843 the French mathematician Jacques Philippe Marie Binet announced that he had found a Fibonacci Formula. Although it was later revealed that other mathematicians, including Leonhard Euler and Abraham de Moivre, had worked out the same formula a hundred years earlier, the formula is today still labelled Binet’s Formula. The Fibonacci numbers have many interesting properties, and the proofs of these properties provide excellent examples of Proof by Mathematical Induction. Here are two examples. The first is quite easy, while the second is more challenging. Every fifth Fibonacci number is divisible by 5. We note first that is certainly divisible by 5, as are and How can we be sure that the pattern continues? We shall show that: IF the statement “ is divisible by 5″ is true for some natural number , THEN the statement is also true for the natural number . 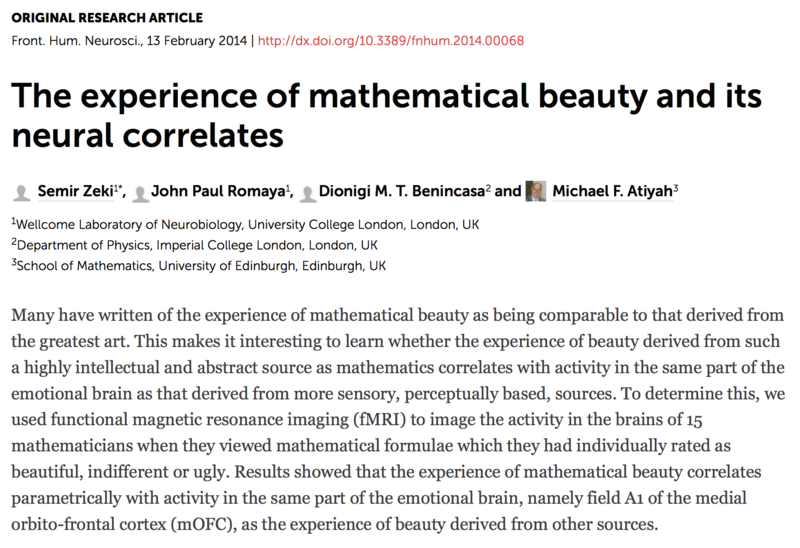 Check out a mathematics and neuroscience paper here, whose authors include Fields and Abel medalist Michael Atiyah. http://journal.frontiersin.org/article/10.3389/fnhum.2014.00068/full published in frontiers in human neuroscience. The difference between mathematicians and other people is not that they are specially clever, it is that they have learned to suffer the journey from misunderstanding to understanding. When encountering new mathematics, mathematicians accept that there will be a time that they are mystified, uncomprehending, in a foreign country where a language is spoken they barely understand. They also know that with persistence, understanding will come. Is misunderstanding important in mathematics? Yes. It’s at the heart of the experience of learning and doing maths. But it’s also the great unspoken, almost like a taboo. I’ve even heard the following: “When a mathematician says he* doesn’t understand something, it’s because he thinks it’s wrong”. We are not supposed to admit that we don’t understand. It almost seems that if you misunderstand, you don’t exist, mathematically speaking, you’re not there, not in the place where mathematics happens, that austere realm where IF YOU CAN BUT SEE, beautiful objects exist in timeless purity. “That is a pack of lies!” Ah, where is Zorba the Greek when we most need him, to protect us against Plato the Greek? For those studying calculus, can you see what Pi has to do with the Mandelbrot set? I’ll give you a hint, it has to do with certain integrals which you have almost certainly studied in class. We will have a post explaining exactly why this number pops up in this particular place, soon! If you don’t know about the Mandelbrot set, take a look here, then have a look at the video above.